Now That’s What I Call a Zebra Crossing! From Monocle (thanks Kottke!) comes news of an intriguing initiative in La Paz, Bolivia. 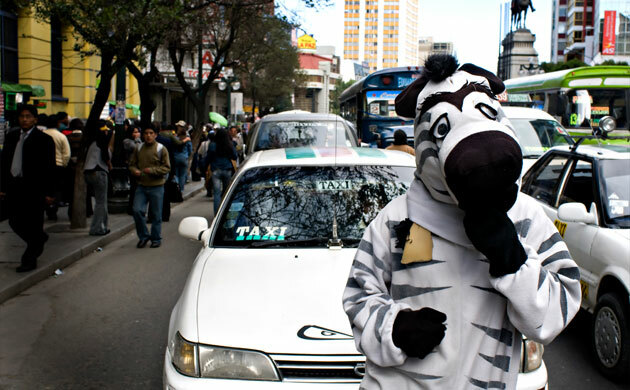 In a place where pedestrians can feel like hapless toreadors weaving through lines of three-thousand pound bulls, the cebras voluntarias help calm traffic and keep order at the city’s intersections. This is similar in spirit to the “mental speed bumps” practiced by legendary Australian traffic tamer David Engwicht, the idea being to use novelty and interest to remind drivers they are in a human environment. For some reason, South America seems to have a lock on these kind of offbeat initiatives; Antanus Mockus, the former mayor of Bogota, Colombia, once hired mimes to silently scorn bad drivers. Mimes, for many people, can engender a hostile response. But who doesn’t like zebras? Truly a road striping innovation. Comments Off on Now That’s What I Call a Zebra Crossing!. Click here to leave a comment.